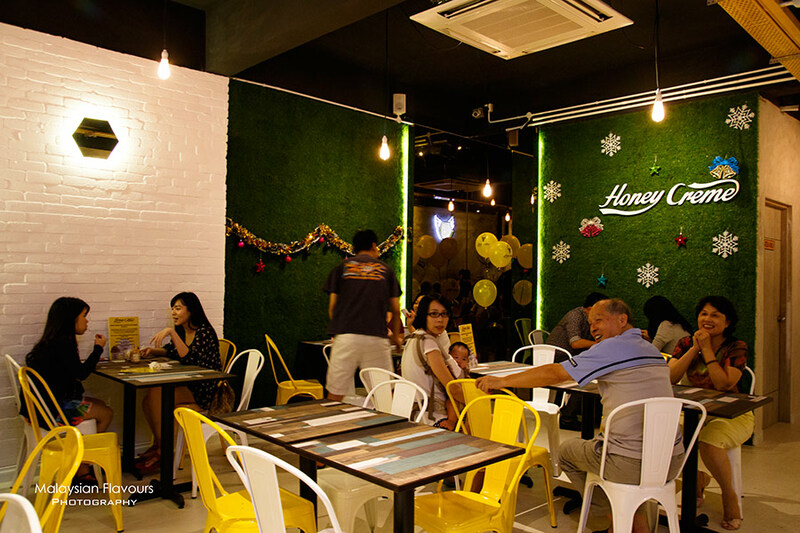 Honey Creme, the Korean-style soft serve ice cream parlor is now opened in Desa Sri Hartmas KL, right beside Mei by Fat Spoon. Speaking about long queue again? We don’t think so. Crowded? Perhaps. This is our first try on Honey Creme, even though we’ve came across the brand in Singapore and Hong Kong. Well, coffee, chicken rice, wantan mee and so forth has already taken our tummy space when we pass by Honey Creme in these two countries. Why not have it in Penang when back in Malaysia? 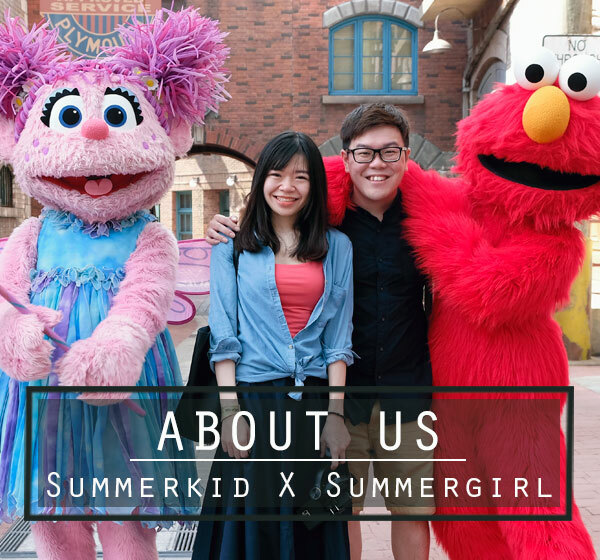 ‘coz we will only think about Char Koay Teow, Prawn Mee, Penang Laksa, Pasembur, Cendol…. 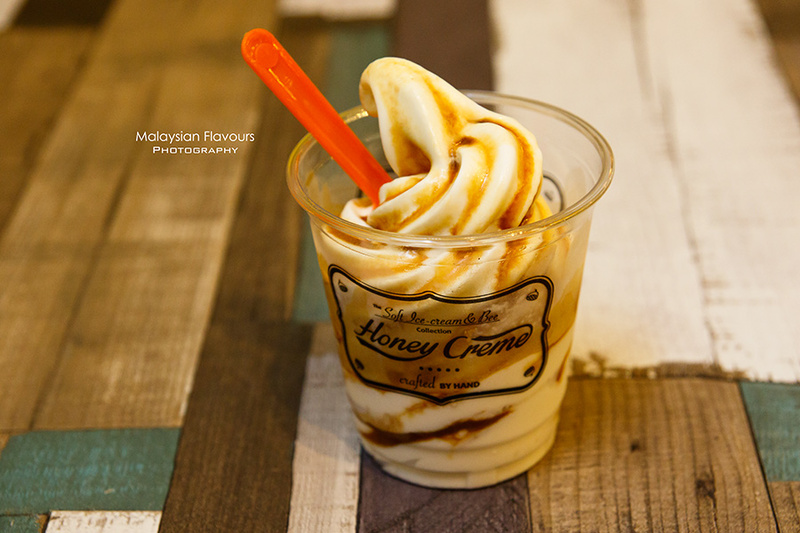 Honey Creme offers over 20 types of flavours and toppings in their menu. 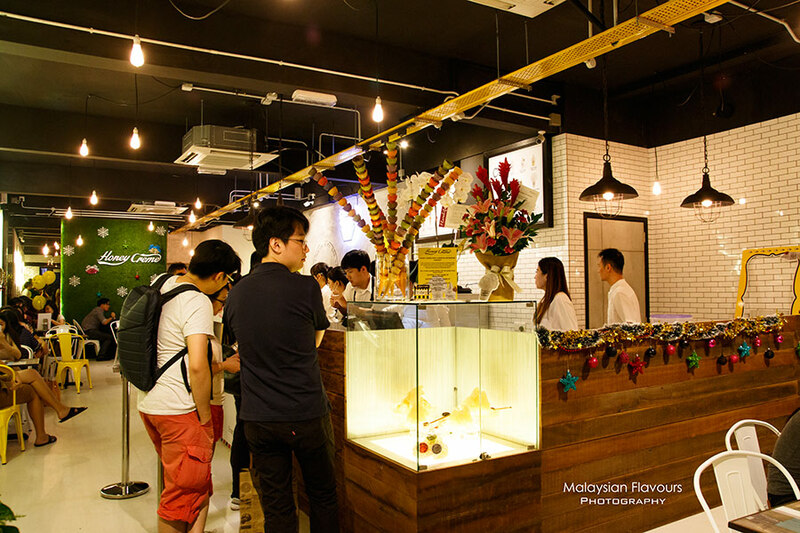 However, currently in Honey Creme Malaysia, you can only flavour up your soft serve ice cream with Dark Chocolate, Honey Comb, Chocolate Beans, Organic Cotton Candy, Affogato, Organic Cotton Candy Affogato, Organic Mixed Grains, Pop Corn, Comb Honey. A standard cup ranges from RM12.50 to RM14.50 in price. You can have them in biscuit ice cream cone too. Pandan Gula Melaka, Durian & Apple Mix, Passion Fruit, Baileys Original Almond Chips, Yuan Yang Milk Tea with Boba, Bacon with Chocolate Coated all sounds more interesting than the classic flavours Malaysia Honey Creme has in the mean time. Hopefully they will be introduced in KL in near future. 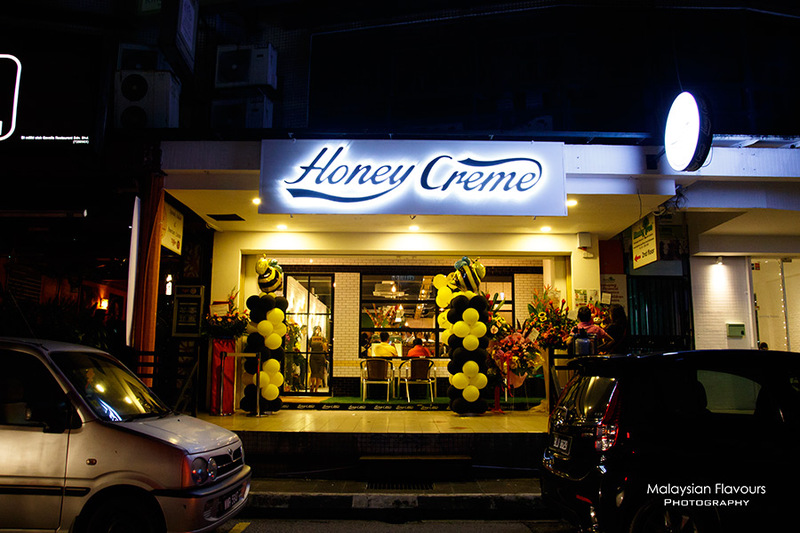 We read quite a number of reviews, saying that Honey Creme is overrated. Personally, we think Milkcow tastes better for Korean-style softserve, even though we aren’t really fans of Milkcow too. Texture & flavour wise, the former is milkier, thicker, richer; the later, is a little pale, more like silky smooth, heavier version of whipped cream. Sweetness wise, Honey Creme is on the winning side. Not as sweet, hence adding honey, dark chocolate sauce or even cotton candy actually make their softserve better. A balance of creaminess and sweetness, just nice to please the palate. Times Square have honey creme??? 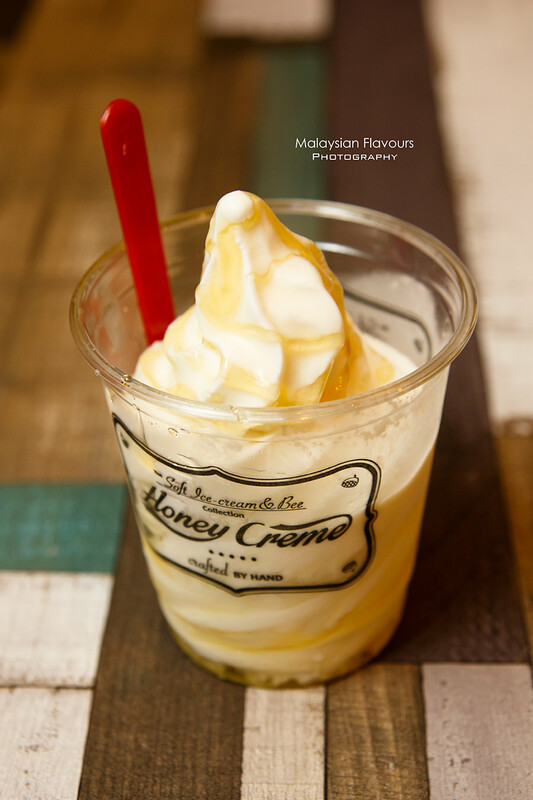 When was Honey Creme open in Berjaya Time Square? I thought Hartamas is their first outlet in KL. hi, so sorry. The one in Times Square KL is HoneyTree. Apologize for the mistake. hehe.